The flexDrive is a chronic drive implant for extracellular electrophysiology that can be used to individually position up to 16 microwire electrodes or electrode bundles in mice, with up to 64 channels. The implant weighs approximately 2 grams, so it can be used in freely moving mice. The small size of the design also makes it possible to target off-center areas, or even to fit a drive implant under a microscope for simultaneous imaging and electrophysiology. The flexDrive is easy to build, accommodates arbitrary spatial arrangements of electrodes, and is compatible with a variety of recording systems (though it is best used with lightweight digital Open Ephys compatible headstages). flexDrive parts and accessories can be purchased from LabMaker. Compatible electrode interface boards can be purchased from LabMaker, Neuralynx, and the Open Ephys store. Channel count: 16 drives, up to 4 channels per drive. Weight: ~2g for 16 tetrode drives. Cost of materials: About $1000-2000 for materials for about 25 drives. Well separated single-unit spikes on a tetrode recorded 290 days post-implant. The ability to individually advance electrodes by small increments results in very stable long-term recording quality. Real-world single-unit yield of the flexDrive implant (16 stereotrodes or 16 Tetrodes) in a study in mouse barrel cortex (Voigts et al. in prep). The mean yield was 25.8 simultaneous single units per session, with a minimum of 8 and a maximum of 46 units. These numbers include some not optimal recordings, and damaged tetrodes etc., but only very few sessions were outright discarded, mostly in the beginning of the drive lowering process where it looked like some electrodes were not in cortex yet, so this distribution is fairly typical of what can be realistically achieved with this type of implant. 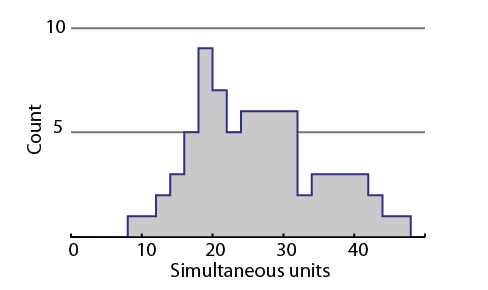 Examples of identified units on stereotrodes, all plots peak/peak. (A) Recording quality sufficient for sorting units can be maintained on an electrode for >100 days by repeated small increments in electrode depth. (B) Example of an electrode that was not penetrating the cortex at surgery, but is lowered into the brain later. (C) Example of an electrode that loses the ability to discriminate units over time, but is “reactivated” by a small depth adjustment ~3 months after surgery. The flexible recording array geometry allows recordings from multiple brain areas. Individual lowering of each electrode makes it possible to hit deep and small targets.